Editor’s note: This is part 2 of a 3-part series. 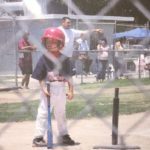 Let’s start back up where yesterday’s article left off on the Dodgers and how they got here. FanGraphs’ PythagenPat and BaseRuns projections both expect the team to be 93-60 at this point, a difference of eight wins from their current record. Baseball Prospectus has multiple record projections, but all of them have the Dodgers with the largest gap between actual and projected performance, expecting anywhere from 93-97 wins at this point. The most games the Dodgers can possibly win this year is 94, at the very least 10 wins behind the last year. If both the starting pitching and the overall offense is performing as well if not better than the squad that won 104 last year, there’s only a few things that can explain the team drastically under-performing this year. One is the bullpen, and the other is offensive performance with runners on. We’ll analyze those over the next couple days. Some people knock on the Dodgers front office for the lackluster bullpen performance this year. While it’s understandable and undeniable that they haven’t been great, it’s pretty clear to see what the front office saw with this bullpen, and why it looked poised for another successful year. Briefly, a few main factors contributed to the bullpen being less successful than last year. 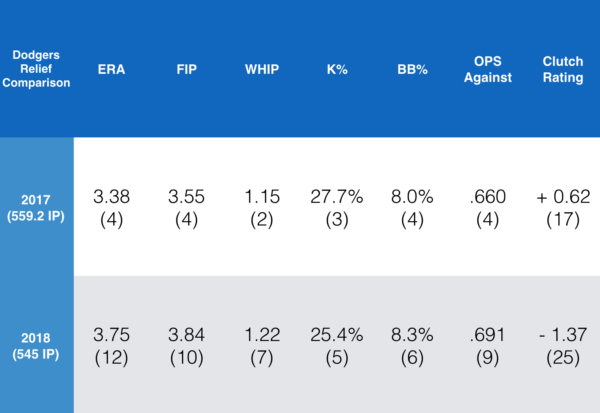 A few key pitchers underperformed, most notably Kenley Jansen, while the team also lost two relievers that helped the bullpen down the stretch last season. One of those is Brandon Morrow who got himself a two-year, $21 million dollar contract with the Cubs, while Tony Watson received a three-year, $9 million dollar deal with the Giants that features incentives that can increase it to $21 million. Whether or not people agree with it, the Dodgers were determined to get under the luxury tax this offseason and there was no way either of those guys were returning at those average annual values. Lastly, a few relievers who should have had decent years missed significant time with injuries, leaving less talented and experienced pitchers to pick up the slack. Overall the bullpen performing worse than average in clutch situations doesn’t help anything, but even last year with a mediocre clutch rating, they were still easily a top five bullpen. Besides that, the most notable difference is the drop-off in overall performance. This has resulted in records of 22-21 in one run games and 8-7 in extra inning games this year, compared to 25-19 and 8-4 last year. Already that’s three more wins and five less losses. The bullpen totaled 97 holds and only 16 blown saves in 2017, compared to just 82 holds and 26 blown saves this year. It’s becoming pretty clear as to where some of the expected wins have gone. Additionally, with the way the injuries worked out, innings that should’ve gone to Tom Koehler, Tony Cingrani, Josh Fields, and Ross Stripling ended up going to Yimi Garcia (21.2 IP), Daniel Hudson (45 IP), Adam Liberatore (13 IP), and Wilmer Font (10.1 IP). Erik Goeddel (29.1 IP) and JT Chargois (31.1 IP) also picked up some innings but ultimately succumbed to injuries, which is just in line with the rest of the 2018 Dodgers. Overall, the relief pitchers had a 3.80 ERA/4.00 FIP in the first half, compared to a 3.58 ERA/3.48 FIP in the second half. Over that stretch, that 3.58 ERA is the eighth-best in baseball while the 3.48 FIP is the second best. Morrow pitched really well for the Cubs this year, but again with a $10.5 million dollar annual salary, the Dodgers were never going to re-sign him. He threw 30.2 great innings this year, but he’s now out for the remainder of the season after dealing with bicep inflammation and a bone bruise in his elbow. With those injuries, he actually would have fit perfectly in the bullpen this year. Avilan was sent to the White Sox in the Scott Alexander deal and he pitched decently before being traded to the Phillies. The Dodgers could’ve used him this year, but Alexander was brought in looking like a clear upgrade. Watson is currently having his best season since 2015, but with the additions of Alexander and a full season with Cingrani, Watson looked like a relatively unnecessary addition factoring in his contractual status. Last year with the Dodgers, Cingrani posted a 2.79 ERA and a 1.86 FIP with a 1.09 WHIP and a 36.4% strikeout rate. In 22.1 innings this year, he posted a 4.84 ERA but a 2.17 FIP which suggested eventually his performance would catch up to his ability. He also featured a staggering 39.1% strikeout rate and a 1.03 WHIP as well. Of 299 relievers with 20+ IP, Cingrani ranked sixth with his 39.1% strikeout rate behind only Josh Hader, Edwin Diaz, Aroldis Chapman, Dellin Betances, and Jose Leclerc. That’s good. He looked completely poised to break out and be an extremely dangerous setup man leading to Jansen. Losing him for the majority of the season hurt particularly bad because it paired with Kenley’s drop in performance, and Cingrani would’ve likely been the best reliever on the team if healthy. Last year, Alexander led the league with a 73.8% ground-ball rate, and has excelled at that again this year with a 70.5% rate. He struggled to start the season with a 4.56 ERA through his first 23 innings, walking 13 while striking out only 15. His poor start skews his overall stats, and misrepresents how effective he’s been over the last 41 innings dating back to June 7. Since then, he has a 2.66 ERA with a 3.00 FIP, allowing only 31 total hits. Alexander is a welcome addition to a relief staff that mostly relied on fly-balls. Additionally, and maybe the most important factor moving forward, is that he has three more years of control than Avilan had. 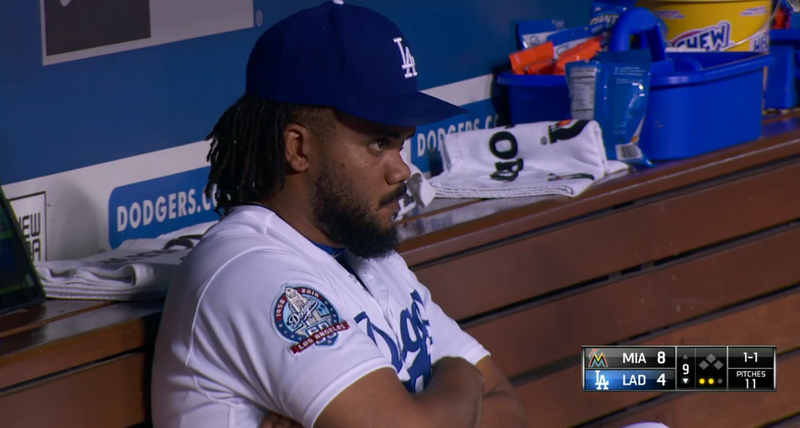 Last year, Jansen logged just one more inning than he has this year, yet he’s allowed 11 more earned runs. His ERA and peripherals have more than doubled, and his strikeout and walk rates have both dropped off significantly. He was unlikely going to replicate his incredible 2017 season where he finished fifth in Cy Young voting, but this level of performance was unexpected. Ultimately this is the biggest difference from the pen last year. He’s blown four saves this year compared to just one last year, and the always reliable elite closer has had a huge down year to the detriment of the team. Three key additions that have helped are Dylan Floro, acquired in an early July trade with the Reds, Zac Rosscup who was claimed off waivers, and Caleb Ferguson who has emerged as a very impressive relief option. Ferguson has seen an uptick in velocity coming out of the bullpen, and his lack of a third pitch hardly affects him at all in that role. Since becoming a reliever, the 22 year-old has just a 2.29 ERA with a 2.99 FIP and a 31.3% strikeout rate. Floro has posted a 1.33 ERA and 2.52 FIP in his 27 innings with the Dodgers, and he hasn’t allowed a run in his last 13 innings. Rosscup is purely a lefty-specialist performing especially well against left-handed batters over the course of his minimal MLB career. The sleeper here is Rosscup who, despite having a mediocre ERA and FIP with the Dodgers, gets a lot of strikeouts and boasts a ridiculous 20.8 swinging strike rate (small sample size of 10 2/3 innings applies here). Across 31.2 career innings against left-handed batters, Rosscup has allowed just a .138 average and a .534 OPS with a 1.01 WHIP, striking out an impressive 36.5% of the batters he’s faced. He’s strictly a situational guy, but the kind of pitcher needed in the postseason. These are the relief pitchers that Dustin predicted would make the postseason roster. The positive side of all the bullpen chaos is that it looks like against all odds, the Dodgers will still manage to put together a pretty strong postseason bullpen when all is said and done. If you compare the eight or nine guys who would probably make the postseason pen to the eight NLDS relievers last year, it sheds a positive light on the current bullpen situation. Last year the eight NLDS relief pitchers had a collective 2.68 ERA heading into the postseason, whereas this year the Dodgers predicted bullpen has a 2.87 ERA. Not much different, however if you replace 2018 Jansen with his 2017 self, that 2.87 turns into 2.49. When removing Jansen from both rosters, the 2017 surrounding relievers had a 3.01 ERA, whereas the 2018 relievers have a 2.88 collective ERA. Theoretically, the talent outside of Jansen is better than the year prior despite the setbacks this bullpen has experienced this year. If Jansen can call upon his 2017 performance, this pen could be a very effective group in the postseason. The bullpen definitively hasn’t been great for the entirety of this season, but as the Dodgers inch towards the playoffs, it’s looking much better. Next step, make the playoffs.